Takeaway: Employees who don't regularly respond to hazardous substance emergencies will require HAZWOPER refresher training annually. HAZWOPER is an acronym that stands for Hazardous Waste Operations and Emergency Response, and training for it is covered under the OSHA standard of the same name. In this article, we'll go over what this important standard is, when it applies, and what your responsibilities are when it does. The HAZWOPER standard mandates specific work policies, practices, and procedures that employers must follow to protect workers from exposure to hazardous substances, as well as information and training criteria necessary to ensure the health and safety of workers during hazardous waste, emergency response, and cleanup operations that involve hazardous substances. The release of hazardous substances can also lead to other dangerous situations, including fires, explosions, high-energy events, and toxic atmospheres. Who Does HAZWOPER Apply To – And When? There are, of course, situations involving hazardous substances where HAZWOPER does not apply. These are referred to as "incidental releases" and include the accidental or foreseeable release of a hazardous substance that is a) limited in quantity and b) does not pose an emergency or significant threat to the health and safety of workers in the immediate vicinity. Employees working with hazardous waste in controlled environments like landfills usually don’t need HAZWOPER training, either. Employers with workers covered by HAZWOPER must ensure that those workers are trained to a standard that allows them to complete their work tasks safely (we'll discuss training in the next section). Employers must ensure that any worker covered by HAZWOPER is fully trained. Initial training consists of a 24- or 40-hour course, depending on the job type and experience. Training should have a practical component. It’s critical for trainees to have hands-on experience and exercises that allow them to become familiar with equipment and safe practices in a setting that is free of hazardous substances. A hands-on component ensures that workers can learn by practical experience and allows instructors to assess whether workers have mastered the skills they require (e.g. donning protecting equipment, using air monitoring equipment). If the course is online, employers must find out how the practical component will be applied. Trainees should have an opportunity to ask questions. Trainees should be able to seek clarification about material that is unfamiliar or new to them. In-person courses easily meet this requirement. Online courses may provide a telephone hotline or email contact that gives trainees access to a qualified trainer if questions come up. Refresher training should be undertaken annually. If the date for refresher training has lapsed, OSHA recommends that employees take the next available refresher training course. He further explains that if you have an active team that drills regularly of has real incidents, they’re continually demonstrating their competency each time they respond. Teams that don’t drill or have incidents will need refresher training to demonstrate that they are still competent. Ultimately, workers must be sufficiently trained to allow them to perform their job duties in a safe manner. This means that employees who have gone a substantial length of time without any training or drills may need to repeat initial training, rather than just a refresher course. The necessity of this should be determined by the employer on a case-by-case basis. Though it might seem complex at first, HAZWOPER doesn’t have to be complicated. Employers should educate themselves about whether the standard is applicable to them and ensure they understand what’s required in terms of employee training and health and safety planning. At the end of the day it’s about practicing safe hazardous waste procedures to protect the health of employees – and it’s the law. 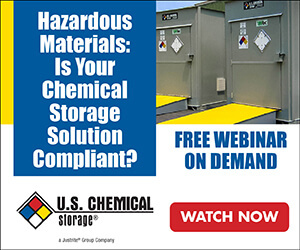 What regulations apply to hazmat storage?